Finally there is a way to quickly, safely and securely pass contact information between personal and professional contacts. Bloop Connect makes the whole process of sharing information and connecting with new people simple, fast and fun. 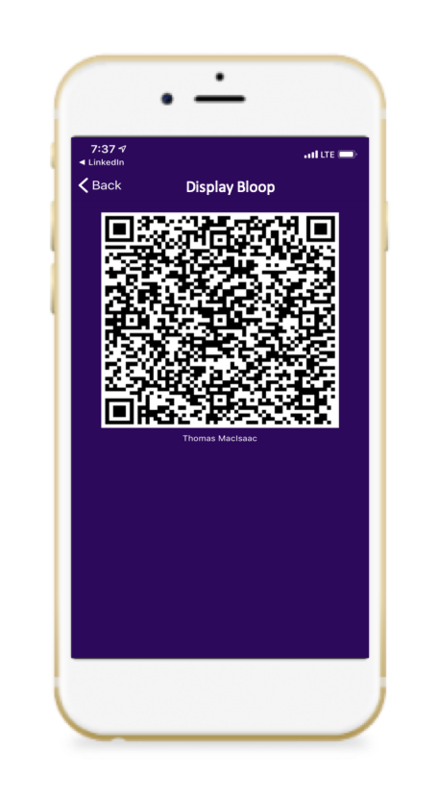 Bloop is a fully supported product available on the App Store. Bloop Connect is super simple to configure and use - you'll be installed, collecting and sharing your first Bloop within minutes. Bloop is so fun and easy that once you use Bloop, you'll find it frustrating typing information in again the old fashion way. Bloop utilizes a modern graphical user interface and graphics that scale beautifully on any size iPhone. 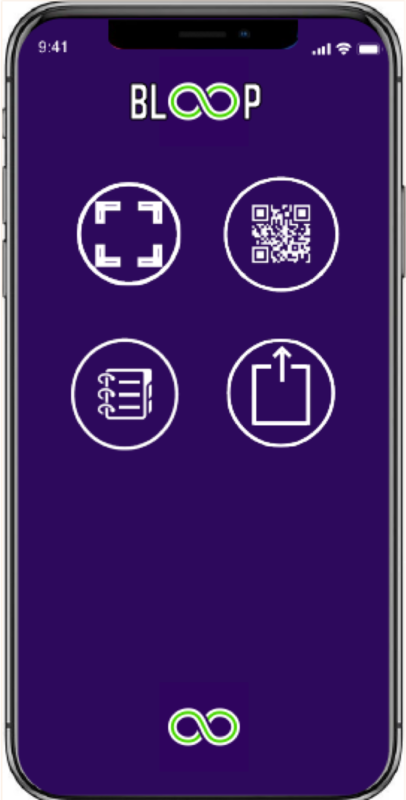 Bloop Connect allows you to transfer information simply by pointing your camera at another Bloop users phone - Bloop is fast, simple, secure and accurate. Stop typing on your phone, save time with Bloop. 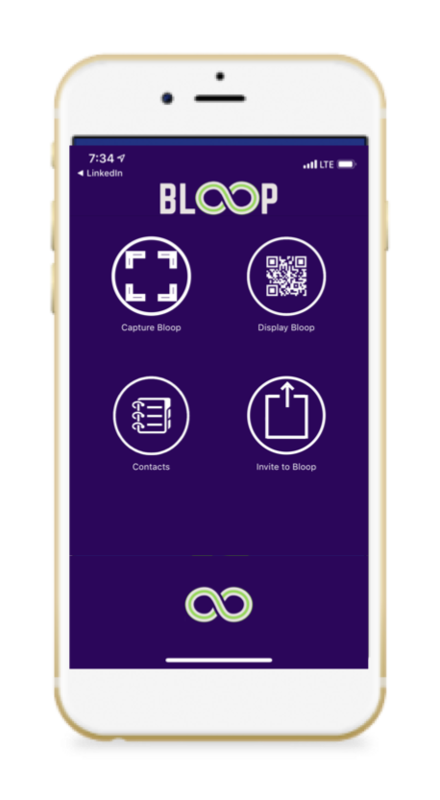 A Bloop Wizard will help get you up, running and sharing information through Bloop in no time. If you can aim your phone's camera then you already have all the skills you need to use Bloop. Build your personal and professional network in the real-world the fast and efficiently. Bloop's primary goal is to facilitate fast, accurate information exchange between one or more parties. We've extended this capability to also aid growing your professional network via LInked-In. A beautifully designed interface makes Bloop Connect delightful to use. Bloop is uniquely designed to streamline the process sharing and collecting information within the real world. Bloop Connect integrates with Linked-In and your phone's operating system to improve data integrity and ease of use. Blooping - whether or sharing or collecting information is fast, really fast. Bloop will save you serious time, ensure greater accuracy, and help build your personal and professional network with ease. Can I save contacts to phone? Yes, once scanned contacts to be added to your phone's contacts. Select that contact that you want to copy over from within contacts, select actions, then select save to contacts. Does Bloop collect or store any information? All communication is between you and the other party, Bloop does not collect any of this information. I just Blooped a contact, how do I add them to Linkin-In? Go to their contact record within Bloop, at the bottom of that record you will find a URL to those individuals Linked-In profile, from there, send an invite. No, Bloop Contacts reside in a local database on your phone and are not backed-up to the cloud. Deleting the Bloop application will result in losing all Blooped contacts. Therefore, we recommend saving important contacts to your phone's contact record from within Bloop. In this current release of Bloop, no it's not possible to have more than one Bloop profile. However, the Bloop code is created every time you hit the Display Bloop. Therefore, you can change your Bloop profile by changing your personal contact record in Bloop. If I save a Bloop contact to my phone, will those contacts change if I make a change to their contact within Bloop? No, Bloop merely copies the record from Bloop into your phone contacts, it will not sync if you make a change within either record.